Facebook has launched a new ad for their Android-based launched called Facebook Home. 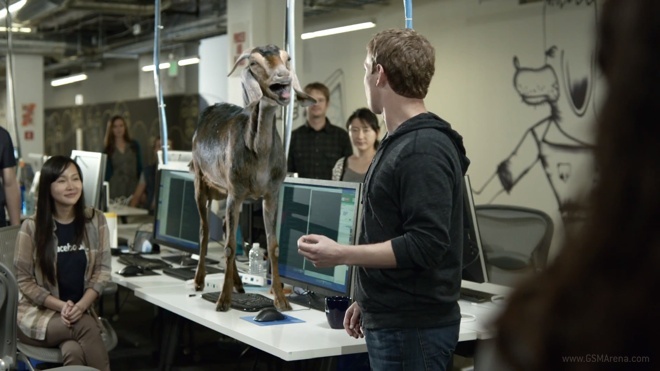 Unlike any of their previous ads, however, this one features the company CEO Mark Zuckerberg himself, along with other members of the team that worked on Facebook Home and is shot in their headquarters in Menlo Park, California. The new ad carries forward the theme from the previous one, where users of Facebook Home start seeing events from their feed happening around them. In this video, Mark is congratulating his team on the work they did on Facebook Home, while one of the employees – Joey – is checking his feed on his HTC First. Soon, the events from his feed start taking place within the office, including a screaming goat, go-kart races and one guy cannonballing into a pool. Of course, Joey is the only one privy to these events while everyone else goes on about their business. The ad is well executed and gets the point across of immersing you completely in your Facebook content, which is what Facebook Home aims to do by removing everything else out of the view and focussing on your feed. You also get a peek at the HTC First in action, although the only real mention of the phone comes towards the end with the AT&T logo. Facebook is no stranger to people but with these new ads Facebook might just end up owning a significant part of your smartphone experience.